Pharell and the rest of the gang from N.E.R.D. 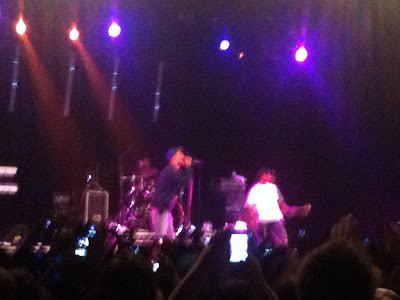 rocked out Sydney a couple weeks ago in a mega bill along with Tinie Tempah, Chromeo and Boys Noize. At least they tried to make it a mega bill. I didn't see TT but I watched Chromeo, Boys Noize and N.E.R.D. all rock one hour sets. Chromeo were pretty cool, I knew like two songs before I saw them but their style makes you feel like you've heard it before (in a good way) and immediately get into the show. Boys Noize did nothing for me. An hour straight of that electic/techno sound he has absolutely did my head in. Boys Noize would be perfect for a 20-30 minute set to get you amped before the main event. Regardless of what I thought, a capacity crowd was there to rock out to Chromeo and Boys Noize and not just for N.E.R.D. N.E.R.D. was amazing. It exceeded my expectations with the type of stage presence that Pharell had during the set. Shay Haley did his bit but you really just felt like the stage and the show belonged to Pharell Williams. Even after listening to N.E.R.D. for years, only that night did I realise how amazing his flow is. He's such a talented rapper/singer and really came to life on stage. The entire band played with a lot of energy and the sound was almost flawless. The mic on Shay could have been better though. I suppose they only played an hour because of the way the night was set up with the other acts but I could see these guys easily playing at least 90 minutes with that same energy and still keeping the crowd interested too. That was the difference between 4 stars and 3 and a half.